UMaxHosting – 1GB Windows VPS from $3.50/month in Los Angeles & more! John from UMaxHosting is back with even more beautiful specials for the LowEndBox community. They are now offering Windows VPS’s after witnessing increased requests from users for this! In addition to this, for those who want a Linux based VPS, they are offering specials on OpenVZ out of their West Coast datacenter location (Los Angeles). Please let us know of any questions/comments/concerns you may have below and enjoy! “UMaxHosting is a hosting provider that specializes in providing maximum performance at the lowest cost possible. UMaxHosting provides a low latency network backed with a 99.9% network uptime guarantee. Additionally, our support staff are available 24×7 to assist our customers with any questions they may have. Our staff are also working behind the scenes to ensure our mission statement is constantly being delivered, without any shortcuts being taken! UMaxHosting supports payment through PayPal, MasterCard, VISA, American Express, Discover, Bitcoin, Litecoin, Ethereum, Monero and Alipay. Kindly read their Terms of Service before making any purchase. Thanks Nick :) We are excited to share our new specials with you all and hope you enjoy them! Sweet Windows VPS deals I must admit. Thinking about snatching up a 1GB or 2GB RAM Win VPS for web surfing purposes. My school blocks access to most websites, but RDP ports are open lol (funny enough). If I can do all my surfing and work via the Remote Desktop, it might very well be worth it. Now the question is will 1GB RAM be fast enough or should I get 2GB… Hmm. Feel free to start off with the 1GB plan and you can always upgrade if you need more resources later on. If i purchase the 1gb plan now, can i upgrade to 2gb plan later on with the price difference? ($30 vs $45) ? i buy one VPS in umax last offer, very fast and stable. I would recommend it to anyone. The best windows VPS from LEB I’ve tried, this vps is really in Los Angeles, super fast internet speed, 2gb 2cores run really good, I might get the 6gb version. One question, how do you reinstall os? I don’t see that option in the panel. +1 I can also vouch for this. I have a cheap 1GB Windows plan but it’s plenty enough resources for me. If I ever need more it’s nice to know I can upgrade. By the way, I reinstalled my VPS plenty of times. It’s a nice feature to have for sure :P I’m a developer and play around with different environments all the time so being able to start fresh when I need to without having to worry about uninstalling applications and whatnot, is a beauty. 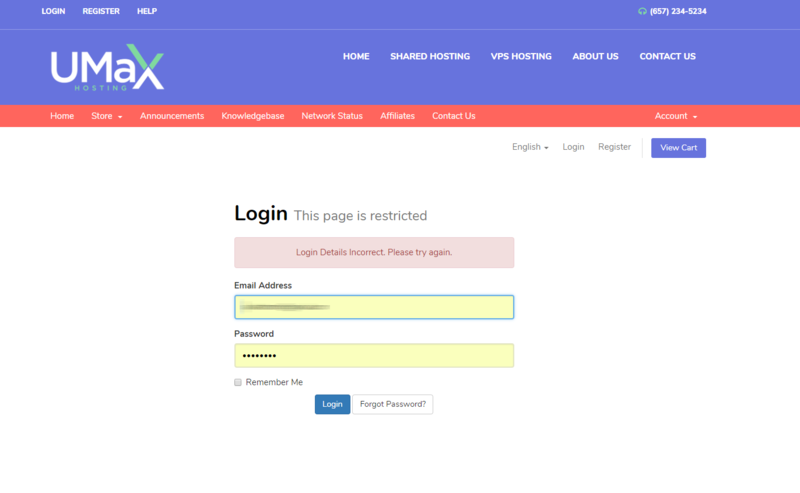 You can reinstall it at the SolusVM panel at https://vm.umaxhosting.com/ the login details are in your email. Windows 6GB is that dedicated server? It is a virtual private server, however with dedicated resources as its powered by KVM virtualization technology. John … are you sure you’re using the term ‘dedicated resources’ correctly? If so, is it just the RAM you are saying is dedicated, or also the CPU as well? Finally, is this being dedicated specific to your windows KVM offering, or does it also apply to your linux KVM offerings? Normally the cached/virtual dedicated are about 2-3 times that price even on LEB… so this seems a bit surprising. hello, I would like to buy $3.50/month just for trial, and Can I upgrade to $45/year later? I’m familiar with solusvm control panel and yet I don’t see that option. Must be broken or something, I’ll be opening a ticket. but by the way your login details can be found in your Email in Spam/Junk folder. I would recommend this provider. Fast support and fair prices. Definitely a good point, and I wanted to let you know that we are aware and working on adding this. So far, we’ve found Windows Server 2012 to work well for most customers and their Windows application needs. Hello Daniel, have you got a reply yet? I’m interested in the 1GB OpenVZ, but with 120GB, how much would it cost? I’m planning to pay the service yearly, but what if I decide to cancel before the end of the period? Couldn’t find any info on tour ToS about running a bittorrent client. Any restrictions? This company is horrible and I’d advice anyone to NOT do any business with them! 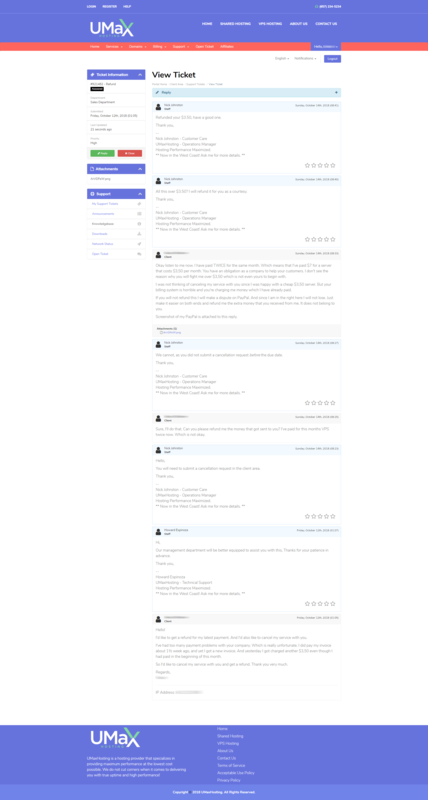 I’ll explain my experience with them (with screenshots of proof). I bought a cheap $3,50 VPS from them (Windows) to host a few IRC bots. Right from the start I had issues with their billing system. I would pay my invoice, but their system did not register my payment. So wrote to them and they sorted it, fine np, I can live with that. However, on the 27th of september I got an email from them, an automatic generated email reminding me of the next payment due date (11th of october). I paid the new invoice on october the 2nd (due date was 11th of october). 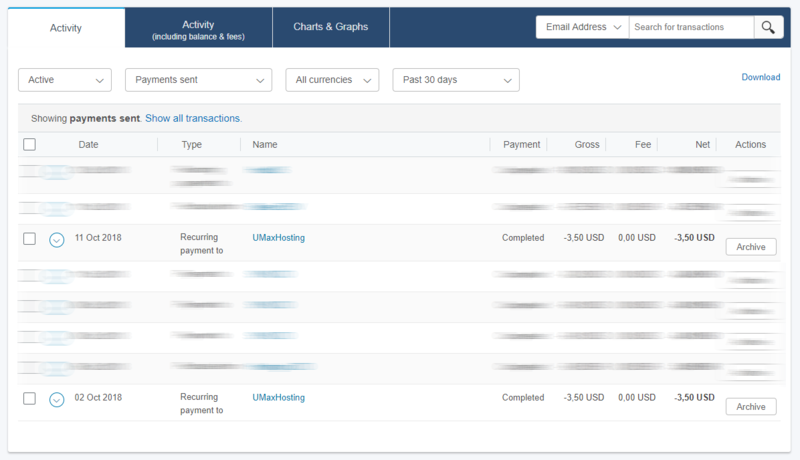 On the 11th of october I received an email from PayPal that I had paid another $3,50 to UMaxHosting so I contacted UMaxHosting and asked them to please cancel my server and refund the extra money that had been withdrawn from my account. But they wouldn’t do it. Not until I threatened to dispute it on PayPal did I get my money back. However, when I canceled my VPS I chose the option to terminate it on the 11th of november. When my VPS was due to expire with them. But after I received the refund they terminated my server along with my account on their panel. So I could not even contact them any further. Here are screenshots (proof) of everything. I am really not a problematic customer. I’d prefer not to have to write a complaint like this. But this server provider is beyond terrible and I’d really recommend people to look elsewhere for their server needs.